Manatees, also known as sea cows, are large, docile sea mammals that swim through inland coastal ways and rivers around the world, in warm and shallow waters. However, these creatures face a regular threat from humans, and from other sea animals like sharks, crocodiles, and alligators. In addition, pollution plays a large role in decreasing their food supply, putting the species in grave danger. Owing to their natural curiosity, manatees often venture into waterways, and end up in collisions with boats. 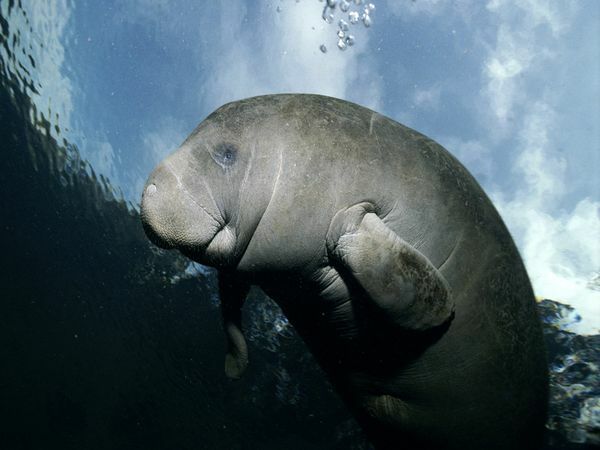 If you are interested in the welfare of the species, and want to help in making sure they stay protected and travel unharmed, consider adopting a manatee in Florida, to contribute towards the cause, and towards the establishment of protected waterways. To begin, contact the Save the Manatee Club to get the ball rolling. This is located at 500 N. Maitland Ave., Maitland, Fla. 32751. You can also call 1-800-432-JOIN to contact the organisation, and ask for an Adopt-A-Manatee application. While filling in your application, you will need to select a location from which you wish to adopt the manatee, and each location is differentiated by their particular programs. The Homosassa Springs Wildlife State Park is focused on rehabilitating manatees before releasing them into the wild again, the Blue Spring State Park has taken on the responsibility of caring for manatees in the area, while the Florida Fish and Wildlife Conservation Commission also makes manatees available for adoption purposes. All the manatees up for adoption can be viewed online – you can select the one you want, from whichever organisation you prefer out of these three. The support level can also be tailored to suit your preferences – to become an Associate you will be required to pay $25, for attaining Friend status you will need to pay $35, while the fee for becoming a Sponsor is $50. These are the more moderate contributions. If you are extremely passionate about the cause, however, you can purchase Guardian status for $100, or Steward status for $500. For every contribution you make, you will receive a membership handbook, a certificate of adoption, and subscriptions to the “Save the Manatee Club” newsletter, and the e-zine titled “Paddle Tails”. If you wish, you can also choose to adopt a manatee online. Simply visit the savethemanatee.org website, and select the “Adopt-A-Manatee” option. Next, click on the “Adopt-A-Manatee Online” prompt, and follow the ensuing instructions to complete the process.